Call me Ishmael, constantly seeking stoutwales but coming across langoliers. A: Sleek, ink black, with a little transparency. Not an exceptional amount of carbonation, just a menacing lacing sitting on top of the rim, warning the latent power lurking below. Nice lacing, sticky and antagonistic. When a stout this big hits you, you feel it. S: There is a toffee/sour finish with an incredible amount of coffee and wood notes. There is a whiskey and bourbon note that wafts above the thick head like an ice cube sitting upon a glass of gin. As a side note, the version of this aged on whiskey chips is amazing, seek it out immediately. 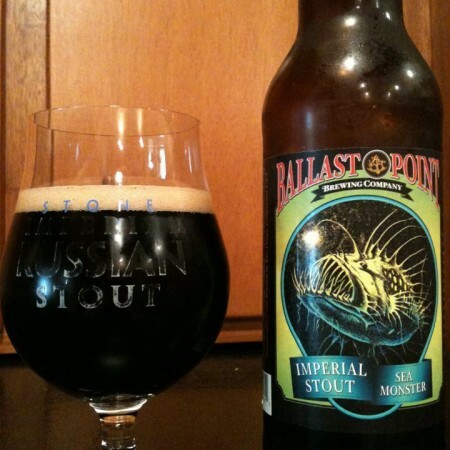 Call Ballast Point and demand it. T: There is a noteworthy chocolate and anise/licorice profile. This beer is as black as Satan’s magic, a thick chocolate milk head imparts its flavor, then oak jumps into the fray with its drying effects. Nice coffee notes resound and add drying effects. Its effect remains throughout the proceedings. For the uninitiated, a stout this big might not fit their palate amiably. Get used to it. M: The mouthfeel coats in a huge way. There is a oily thick particulate effect to the stout. The coffee and burnt raisins just coat and linger, making up a remarkable base camp with occasional visits from smokiness and chocolate. Strangely the body isn’t exceptionally thick but it has sticky coating. Which is unusual given the strange balance. D: Despite the crazy nature of this beer, it remains exceptionally drinkable for the style. While it coats in a huge way and certainly wouldn’t feel at home in a 6 pack, it has a great disposition that makes you want to take another sip. Most people would shy away due to an unfamiliarity with style or an aversion to the menacing black character, however, for those tried and true, this is certainly worth the outing, maybe even 2 bombers. This isn’t a milk stout, but it still delivers extreme satisfaction. Not a shelf wale, a shelf Monster. Narrative: Skip was born jet black, without a white belly. His inky black eyes showed permeable anger, the other Emperor Penguins mocking him. His beak clenched watching the others feed upon cephalopods. “Look at them, their proud plumage, mocking me like sneetches without stars upon thars, I will show them.” Skip was advanced for his age and, despite his lack of opposable thumbs, has fashioned an ice shiv from the shearing of an errant glacier. “I will show them the true darkness of their ways.” No one would mate with Skip and rumored his jet black eggs that would result. He had a sweet core and a lighthearted personality, but no one would give him the benefit of the doubt. Skip burned with the rage of a Patagonia summer. We will see whose cold is imparted this winter, that of my black coat, or that of black death. He gripped his shiv knowingly, awaiting the grip of the winter.